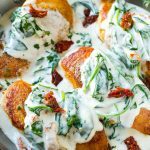 This sun dried tomato chicken is juicy golden brown chicken breasts smothered in a creamy spinach and sun dried tomato sauce. An easy dinner that’s perfect served over pasta! When I make this chicken in sun dried tomato sauce, I feel like I’m eating at a restaurant. It’s so incredibly delicious and is ready in under 30 minutes. I feel like sun dried tomatoes are one of those under utilized kitchen ingredients. They’re convenient to keep on hand and pack SO much flavor, they make any dinner taste special. 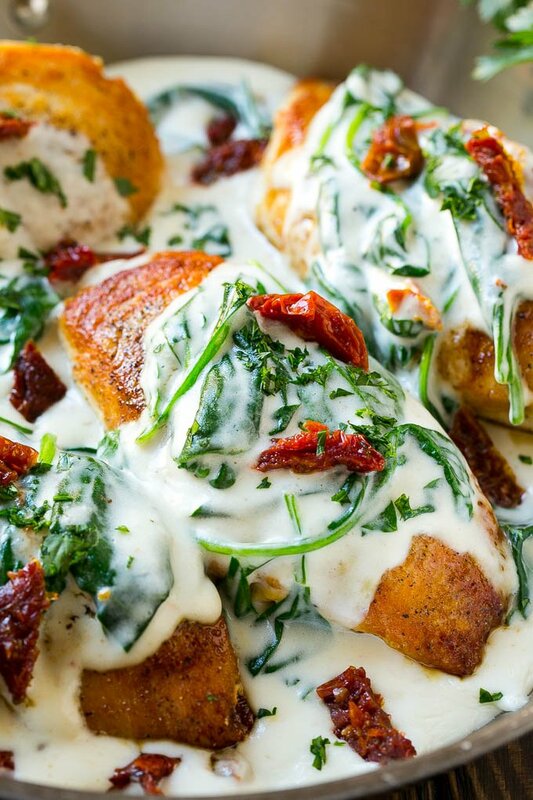 I’ve paired the tomatoes with fresh spinach and a parmesan cream sauce for this delectable sun dried tomato chicken. This is the perfect dinner for a busy night because it cooks quickly, is super satisfying and doesn’t require a lot of ingredients. The first ingredient in this recipe is the chicken. I use boneless skinless chicken breasts cut thin so that they cook quickly. You can use boneless skinless chicken thighs or thicker chicken breasts, but you’ll need to increase the cook time. The chicken breasts are seared to golden brown perfection, then removed from the pan so that the sauce can be made. 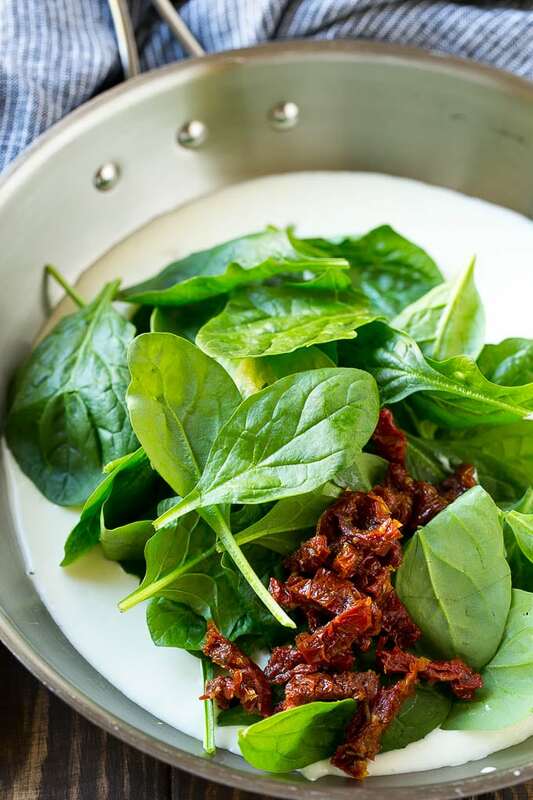 The sauce is a creamy parmesan base with the addition of fresh spinach and sun dried tomatoes. If you don’t have spinach, kale would also be a great choice. The chicken gets returned to the pan and is smothered in the super delicious sauce. Add a bit of parsley and you’re done! My favorite way to serve this sun dried tomato chicken is on a bed of pasta to soak up all the sauce. I typically use angel hair pasta which cooks in just minutes. Other great choices are orzo, polenta, or even quinoa. Sometimes I make this creamy sun dried tomato sauce and serve it plain over penne pasta, or add some shrimp. It’s even great over pork chops. If you’re looking for a restaurant quality meal at home, this sun dried tomato chicken is a must try. While it’s easy enough for a weeknight, it’s also elegant enough to serve to company! This sun dried tomato chicken is juicy golden brown chicken breasts smothered in a creamy spinach and sun dried tomato sauce. An easy dinner that's perfect served over pasta! Heat the olive oil in a large pan over medium high heat. Season the chicken breasts on both sides with salt and pepper. Place the chicken in the pan and cook for 4-5 minutes on each side, or until golden brown and cooked through. Remove the chicken from the pan; place on a plate and cover with foil to keep warm. Wipe out the pan with a paper towel. Melt the butter in the pan. Add the garlic and cook for 30 seconds. Add the flour and whisk until combined with the butter. Add the chicken broth and heavy cream to the pan. Whisk until well combined. Bring to a simmer. Stir in the parmesan cheese. Add the spinach and sun dried tomatoes. Cook until the spinach has wilted. Turn off the heat. Add the chicken back to the pan and spoon the sauce over it. Top with parsley and serve. I buy thin cut chicken breasts for this recipe. 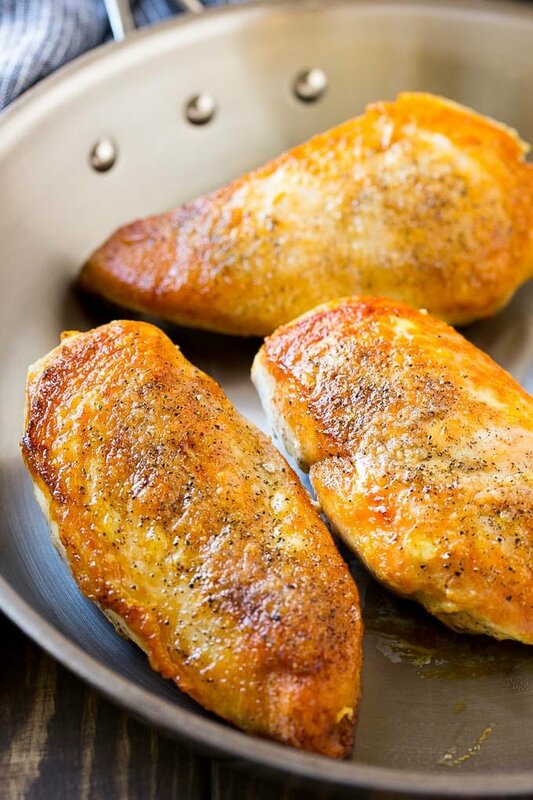 If your chicken breasts are thick, either increase the cook time or use a knife to cut them in half lengthwise. This recipe is so, so good. Tastes like a restaurant made it! 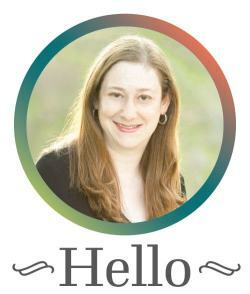 I have made this almost weekly for the past month. No changes needed- Myself, my husband, and our two year old gobble it up! Sounds like a delicious dinner. We are on a huge spinach kick lately. Have to give this recipe a try. Wow, lots of yummy recipes I have seen today, this one included. I have never tried using sun dried tomatoes yet, I would like to try it someday. This chicken dish sounds incredible. I would totally love to try this recipe one day! I am a big fan of sundried tomatoes. I love sun dried tomatoes and it’s nice to see a dish like this that’s not only flavorful but easy to make. This looks really good! This is my first time to learn about this recipe and I am quite interested. Seems so delicious and healthy. I hope I can also make this one successfully. I love learning new dishes. This is a fresh recipe for me since I use some of the ingredients for other recipes and this is certainly a must try! More so this is also very healthy and I am assuming that it’ll be loved by everyone. This sounds delicious. I love finding new ways to cook chicken, because I eat it a lot? Now this sounds like a meal which is right up my street. I think it amazing how chicken goes with so many different types of meal and this one sounds wonderful. This looks really delicious, I would love to add in some angel hair pasta noodles. That would be the perfect finish for this meal. Every Thursday we cook dinner as a family and try out new recipes. This is a good one for us to try. Oh delicious! Anything with sun-dried tomatoes, count me in! This doesn’t look too hard to make and I am sure everyone in my family would love this, which is a total plus. I love it! I agree sun-dried tomatoes are underused, well at least in my kitchen. I do love them though. This looks like a hearty fabulous dish! That chicken looks totally terrific. 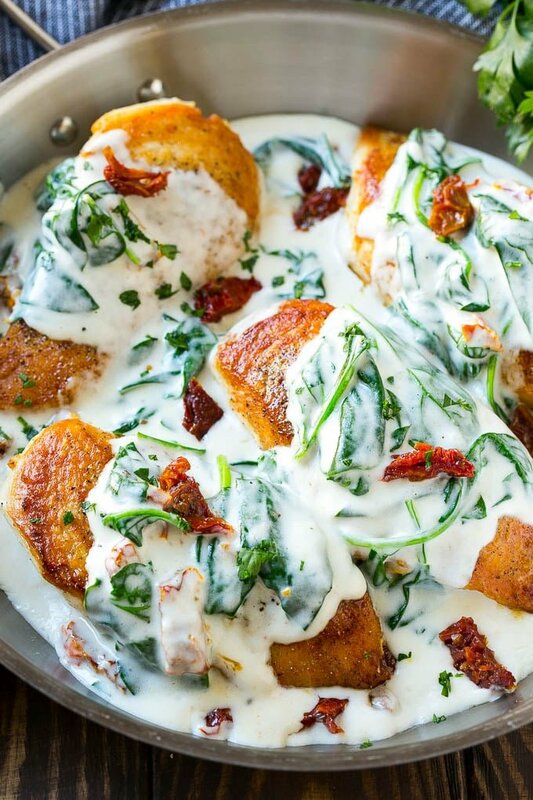 Hubby loves spinach so I know he’d enjoy trying this chicken dish. This looks amazing! My kids would absolutely love it! I have to pick up the ingredients when I hit the store today so I can make this. Thanks so much for the recipe! That looks absolutely gorgeous! I know that sounds strange when it comes to food but I love the colors in it and I know just looking at it but I want to try it. What a perfect dinner this will make! I’ll add it to my list. I’m pretty sure everyone in my family will love it. I love finding new ways to incorporate sun-dried tomatoes into recipes. I love the addition of spinach leaves too. This recipe certainly looks like a winner to me! This would be perfect for dinner tonight. That sounds like a delicious meal idea. I know my whole family would love this! I can’t wait to make it for them.